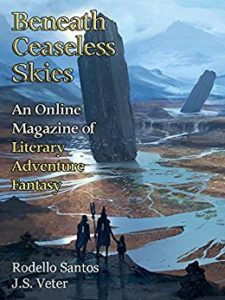 ‘Crescendo’ Published in Beneath Ceaseless Skies! Yacob’s crib-sister, a great one for adventures, discovers a Hole whispering in the most forbidden part of the City. This is how the story spreads, no matter how many nets the Finders put up, no matter how much forget the Fillers throw in. The daddies teach that some things must remain forgotten; but the City remembers, the Beneath is overflowing, and the story wants to be told.